If you work for Syracuse University and you haven’t had a flu shot yet, you’ll have another chance next week to get vaccinated—for free—against the most common types of flu expected to strike during this flu season. 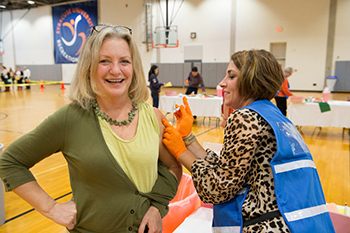 A staff member gets vaccinated at one of last year’s flu shot clinics. The Office of Human Resources is partnering with Health Services to provide free flu shots to SU faculty and staff on Tuesday, Nov. 10, from 4-6 p.m. in the Miron Special Events Room (Room 303) of Newhouse 1. This clinic is being offered later in the day in an effort to accommodate employees who find the later time more convenient. You will need to show a valid SU employee I.D. to get vaccinated. Temporary employees may show an alternative picture I.D. No appointments are necessary; just show up and get your shot. If you have any questions, please contact the Human Resources Service Center at 315-443-4042 or hrservic@syr.edu. This is the fourth University-sponsored flu clinic for employees; at this time, no others are planned. More than 1,100 faculty and staff rolled up their sleeves to get vaccinated against the flu at three clinics held at SU in October. About 1,600 SU and ESF students have been vaccinated so far this year, according to Health Services. The student clinics continue on Thursdays through Nov. 19.